Mya Johnson, a senior at Lyme-Old Lyme High School, is the recipient of the Hank O’Donnell Female Athlete of the Year Award, named in honor of a former sports editor and columnist for the Waterbury newspapers whose career spanned 61 years. Johnson tallied 19 goals and 10 assists in 2018 to lead Old Lyme to its fourth straight Class S state soccer championship. Lyme-Old Lyme Senior Captain Mya Johnson, who was named the Hank O’Donnell Female Athlete of the Year yesterday by the Connecticut Sports Writers Alliance. Photo by Jennifer Alexander. 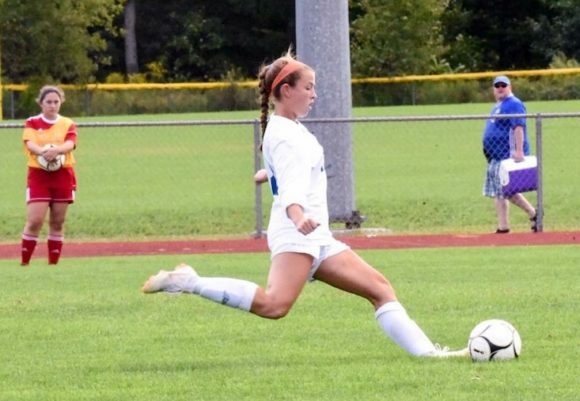 She was at her best in the big moment, scoring the Wildcats’ final five goals of the tournament, including a hat trick in a 3-1 semifinal win over East Hampton and both goals in the 2-1 state title victory over longtime powerhouse Immaculate. Trailing by a goal in the finals, she tied the score by booting home her 100th career goal, then converted the game-winner for number 101. 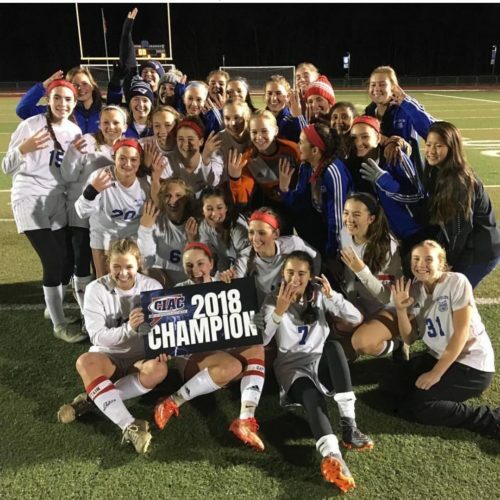 Johnson scored both goals for the Wildcats to defeat Immaculate 2-1 in the 2018 Class S CIAC state championship. The list of Johnson’s awards and accolades is remarkable, reflecting her exceptional talent. She was named an All-New England player in 2018 and 2017, and selected in 2018 as The Day’s All-Area Girls’ Soccer Player of the Year and named to the Class S All-State Team both for the third time. Johnson, who is also an outstanding artist, will continue her career close to home next fall at Connecticut College. Harry Stanton, a 2018 graduate of Wesleyan University in Middletown and three-time college All-American lacrosse player, will receive the Bill Lee Male Athlete of the Year Award, named after a longtime sports editor and columnist who wrote for the Hartford Courant for nearly half a century. Stanton, a former three-sport athlete at New Canaan High School, led Wesleyan to the school’s first-ever team national championship, an 8-6 win over Division III power Salisbury at Gillette Stadium. Stanton netted two goals and added an assist in the championship contest to earn Most Outstanding Player honors. Johnson and Stanton will be honored at the 78th Gold Key Dinner on Sunday, April 28, at the Aqua Turf Club in Southington. Gold Key Award recipients for 2019 are former college and pro basketball standouts John Bagley and Chris Smith, longtime NFL coach and Super Bowl champion Chris Palmer, St. Thomas More basketball coach Jere Quinn and ESPN founder Bill Rasmussen. The Gold Key Dinner was inaugurated in 1940, with baseball legend Connie Mack and golf superstar Bobby Jones among the initial recipients. The roster of honorees since then reads like a Who’s Who of Connecticut sports – Joe Cronin, Julius Boros, Willie Pep, Andy Robustelli, Lindy Remigino, Floyd Little, Joan Joyce, Carmen Cozza, Otto Graham, Calvin Murphy, Joe Morrone, Gordie Howe, Bill Rodgers, Tony DiCicco, Geno Auriemma, Rebecca Lobo, Brian Leetch, Kristine Lilly, Marlon Starling and Dwight Freeney are just a few of the past Gold Key winners. A complete list is available at www.ctsportswriters.com. Tickets to the Gold Key Dinner are $75 apiece, and may be reserved by contacting CSWA President Tim Jensen of Patch Media Corp. at tim.jensen@patch.com or 860-394-5091.